Choosing a proper chemical storage building for your application can be intimidating. Regulators have strict standards, while suppliers provide numerous options. Disregarding regulations is expensive. The Occupational Safety and Health Administration (OSHA) holds companies accountable for creating and maintaining a safe working environment. They cited and fined a company $272,000 in 2013 for various violations. Investigations revealed a lack of secondary containment in their chemicals storage area. Officials also found some chemicals were not properly stored outside an approved safety building. How can you keep employees safe and meet regulatory requirements – but at a reasonable cost? Follow these 5 steps to choose a chemical storage building best suited to your needs. Suppliers issue a Safety Data Sheet (SDS) with every chemical. It describes the properties of the chemical and the hazards associated with it. Review the SDS to identify which chemicals are hazardous, flammable or combustible. Each category has specific requirements for proper storage. Incompatible chemicals can be stored in separate rooms within one building or in separate buildings altogether. Depending on their location in proximity to other occupied buildings or property lines, chemical storage buildings may require fire-rated construction. Flammables and other chemicals with low flash points will need explosion-proof electrical components. Exhaust fans, fire suppression and other components could be required to remain compliant with local and national regulations. Always consult with your local code authority. International Building Code (IBC), NFPA, OSHA and other governing bodies set requirements for the proper storage of any chemicals, including flammables, combustibles, corrosives, oxidizers, organic peroxides, pesticides, etc. Wall construction requirements depend on the proximity of the chemical storage to occupied buildings and property lines. IBC codes require fire ratings to provide time to evacuate surrounding areas in the event of a fire. To determine the proper building size and footprint, you must identify the types and numbers of containers to be stored. Understanding the inventory ensures the size of the building and the spill containment are compliant and optimal for your application. U.S. Chemical Storage buildings feature elevated flooring. This is due to the secondary containment sump underneath, which catches spills. Select the standard elevated flooring with a load rating of 500 lb. psf, or specify a higher rating according to your needs. Standard widths and lengths of chemical storage buildings are 6-, 8-, 10- and 12-feet, but can extend up to 52-feet. Choose a combination of standard units or customize a building to the size you need. The design of a chemical safety building should make transferring chemicals easy. Customers can specify the number of openings. Choose entry ramps or steps as well as racks or shelving systems. Multi-tier racks are available for totes and pallets or drums. Their heavy gauge construction makes them capable of enduring long years of daily wear and tear, loading and unloading. Select horizontal drum racks for gravity dispensing. Choose sump shelving to contain small leaks and spills at the shelf. It is easier to clean a small shelf spill than a large spill in the secondary containment sump. Durable and strong, the steel construction handles heavy load requirements. Secondary containment is an integrated sump that catches spills and leaks inside the building. 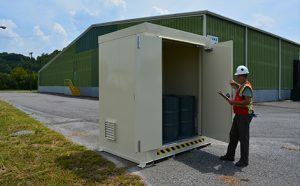 U.S. Chemical Storage buildings offer Environmental Protection Agency (EPA) and OSHA compliant sumps. Standard spill containment sumps are made using continuously-welded 10-gauge steel sheets at the base, as well as structural steel tubing to create the vertical walls for the containment. Each U.S. Chemical Storage sump is tested at the factory to be leakproof. Sumps prevent spills from leaving the building and polluting the environment. Contact U.S. Chemical Storage to learn more about choosing the proper chemical storage building that fits your needs. Our professional consultants help you find the best solution for your application. We provide complimentary quotes for solutions that meet the regulatory requirements.